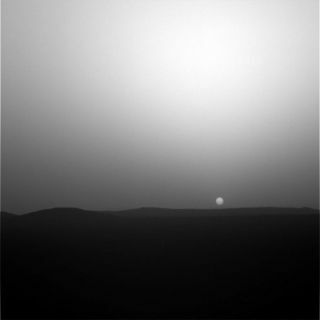 Highatop Husband Hill within Gusev crater, the Spirit Mars rover is performingnighttime astronomical duties. Fromits "top of the world" vantage point, Spirit has snagged images of the two Marsmoons--Phobos and Deimos. The robot is also assessing weather features in thedark of the night on Mars. Other nighttime duties are being discussed, such ascharting meteor showers on the red planet. "We'reactually shunting some power during the daytime. So we'd much rather use thatpower to do some science instead of shunting it out as waste heat," said JimBell, an Associate Professor in the Cornell University Astronomy Department in Ithaca, New York. Bell is lead scientistfor the Panoramic Camera color imaging system carried by the dual Mars robots:Spirit and Opportunity. Havingso much power has allowed group controllers to task Spirit to execute nighttimeobserving campaigns, Bell told SPACE.com. Whileeach rover is equipped with a Panoramic Camera--or PanCam--the devices are nottelescopes. "Still, we can do some pretty good astronomy," Bell said. Spirithas been able to snap shots of both Phobos and Deimos together. "We're killingtwo birds with one stone by selecting times when those two moons pass eachother in the sky. That does frequently happen...every couple of nights," Bell said. Bell said that, bytaking the nighttime photos, a better understanding of where those two moonsare in their respective orbits becomes possible. "We'regetting some good orbital refinement on the positions of the satellites," Bell added. "They haven't been monitored by astronomers since the late 1980s." Inaddition, by using color filters on Spirit, colors of the two martian moons canbe ascertained, Bell noted. Spirithas also gazed longingly up into nighttime sky for meteorological purposes. "We'relooking for any evidence of clouds forming at night, or fog, or haze," Bell said. To do this job, nighttime shots are being taken using the backdrop of stars--aswell as Phobos and Deimos--to help pin down atmospheric phenomena. Asthe two moons slip by overhead, Spirit is getting a spectacular view. Deimoslooks pretty much like a star, far away. But Phobos is an eyeful, Bell observed. "Youcan clearly see that Phobos is an oblong, potato-shaped object in the sky. It'snot as big as the full moon, but it is still pretty decent in size," Bell said. A soon-to-be-released image will show features on the surface of Phobos, hesaid, "and this is with not much better than human eye resolution!" Infact, Phobos is so close and large enough, a person standing on Mars, within afew minutes, would notice the moon moving, Bell said. Thanksto the rover's power levels, Bell said that a proposal is being made to useSpirit to observe meteor showers this fall. Justlike here on Earth, the red planet also sweeps through areas of space ladenwith comet debris. Scientists want to evaluate the flux of these smallparticles streaming into the martian atmosphere. "Thereare models that predict certain rates of meteors, and like on Earth, there areshower times," Bell said. Spirit's nighttime powers should help record thatshower activity, he said.